Well, 2018 was an incredibly busy year at KPH and we had more than a hectic run up to Christmas with many of last month’s horseboxes being very exciting Christmas presents! Rounding up for 2018, workshop cleanliness was as usual, one of our focus points. Cleanliness directly transfers into how we treat everything from workshop tools to goods in trust (customers’ horseboxes). It is also why we are happy to pay a little extra insurance and walk customers through the workshops. Our fixation with the little details is continually ingrained into every member of the team and it directly affects quality. Few companies show customers work in progress and it is where we shine. From the beginning we wanted to be as open as possible and show customers both build quality and our manufacturing process. These are points we are proud of and they will always be a big part of the company. Firstly, it would be difficult to round up 2018 without mentioning the continuing Brexit debacle. We can report that although this past year has seen plenty of scaremongering and tales of woe , KPH have continued with our measured expansion and sales have also increased substantially. This is a testament to our outstanding product quality and customer service. It also highlights how our focus on using UK manufactured products is working to great effect in our sector. It is worth pointing out that nearly every single supplier has tried to pass on price increases due to Brexit and in almost every case we have simply put extra time and effort into finding a UK supplier for the same or improved quality product. As a notable example of how quickly some suppliers (you know who you are) saw the quick money opportunity, a mere two hours after the decision to leave the EU was announced, we received an email stating an immediate price increase of 17% and it is fair to say we didn’t use them again. Sadly though, it has set the tone of what has followed. Ending this paragraph on a positive Brexit note, we took the opposite approach and made an early decision to fix our prices and buck the price increase trend. We of course still have increases due to product improvement and development from time to time; however, to date we have passed no Brexit increases on to our valued customers! 2018 has seen us manufacture a record number of horseboxes from the 3.5 tonne Aeos all the way up to maximum length HGV Helios horseboxes. We worked through several large commissions, including 18 tonne and 26 tonne HGV horseboxes. On top of spraying our own builds, the paint team has seen a record numbers of horseboxes and commercial vehicles through the door. 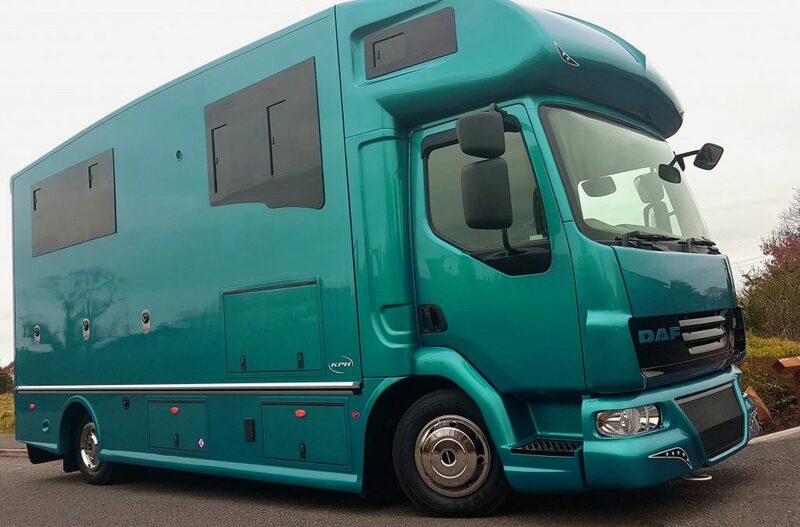 We have manufactured some truly bespoke horseboxes in the past year and the KPH Commercial sprayshop team has transformed them with spectacular finishes in metallic and pearl paint colours. If you follow us on social media you will have seen some of the weekly images we send customers to show build progress. The stunning transformation from primer coats to finished paintwork are always well received by both the customers and horsey community. This consists of Janet, Russell, John, myself with of course Izzy and Gem to ‘meet and greet’ the customers. Although not clearly visible from the outside the office has seen big changes. We have streamlined many procedures throughout the business and we are all extremely focused on customer service. This remains a priority and is an area where we continue to shine. Although we are very serious about service and product quality, we keep the office a fun place to work and it is pleasure to turn up each day. We should add that team building for the whole business has been high on our list of priorities again. Being a forward thinking company, innovation is always at the forefront of our horsebox design. 2018 was packed with innovations and they range from adding a full stainless steel ramp to the Aeos horsebox range all the way through to improved solar and auxiliary systems. From our very skilled fabrication team there have been refinements to our stunningly beautiful stainless steel horse partitions and horse doors as well as a myriad of improvements all aimed at better quality and improved longevity. We are constantly testing new ideas and working hand in hand with manufacturers, universities and customers to develop new products and systems that have practical benefits for our horseboxes and the horses they transport. Innovation, coupled with ‘stunning’, is our goal and the real fun is building it into every horsebox and ‘blowing our customers minds’! If you follow us on social media you will see throughout the year there has been a recurring theme, with quite a few pictures titled ‘proud of our horseboxes’ or ‘proud of our manufacturing’. At KPH this is a fact you can take as read, it is something we cannot teach, but is from the heart and applies equally to every member of the team. Each commission has been a journey and has received the same meticulous attention to detail from each member of the team. We are ‘proud of our horseboxes’ and post the very same pictures on social media as we post to our customers to show build progress. You will notice we don’t push sales or employ sales people, instead our happy customers are our ambassadors and we simply post the facts, including payloads and some stunning pictures. We answer any questions that follow and let customers make up their own minds, without pressure. Whilst we post more general images, customers can request more detailed information from our Contact Us page, where they can tick boxes for information about specific models. Throughout the last two decades we have continued our focus on improved lightness with added strength and safety features. Payload is an ongoing endeavour where we test and tweak construction techniques and even materials, but only where it benefits customers and horses. Saving just a few kilograms here and there is very difficult, especially as chassis manufactures tend to add weight back on with each incarnation of the latest Euro emission standards. As you would expect the net has tightened yet again on overweight horseboxes and the market is flooded with them. Payload still remains an industry-wide problem and no amount of small print can cover it! We think it is fair to say payload will always be an ongoing battle and for this reason have invested in onsite weighing facilities that are an added benefit to our customers and it also means we can talk facts. Happily we can report that 2018 has been a great year all-round. We have invested in infrastructure, new team members and equipment. We have seen many improvements in increased standard specification, payload and longevity across the range. For our customers, we have worked extra hard to keep Brexit disruption to a minimum and without passing any cost on. We have invested in our team and have a happy workforce, taking pride in their workmanship. We have also learned some important life lessons over the past twelve months. 1. More than two dogs in the office is just plain crazy. 2. Customers cannot own enough horses. And finally we would like to express our thanks to our loyal customers; we value your patronage and appreciate your confidence and we hope you can see that we do go the extra mile. For the future there are many new projects planned and customers can rest assured we will not stand still or compromise on our high standards. We hope you continue to follow us on social media where you will see us serenely swimming upstream like swans, but believe us when we say we will be furiously paddling underneath! So roll on 2019 and don’t forget to pop in anytime if you are passing, our kettle is always on. …oh and don’t forget life is too short to drive a boring horsebox!! !